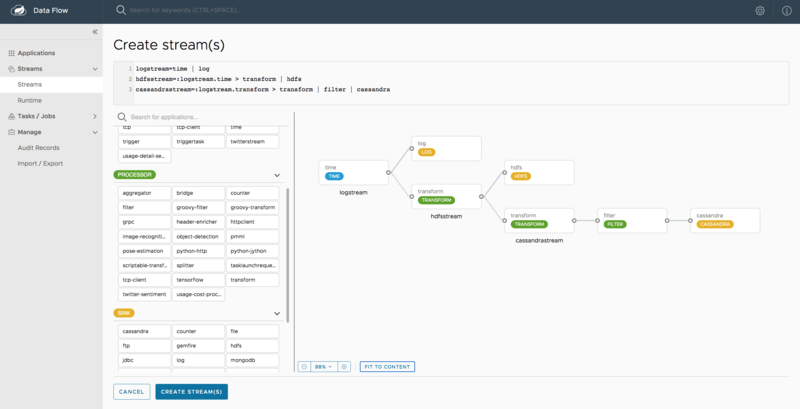 On behalf of the team, I am pleased to announce the GA release of Spring Cloud Data Flow 1.1. Follow the links in the getting started guide to download the local server implementation and shell to create Stream and Tasks. Builds upon Spring Boot 1.4, Spring Cloud Camden SR2, Spring Integration 4.3 and Spring Cloud Task 1.1 release improvements. Adds the ability to pass application specific properties via YAML file. This is particularly useful when deploying streams that require many deployment properties to be set. Portable deployment properties for memory, disk and cpu are in place for support across various runtime implementations. Updated reference documentation showing how to integrate with Spring Boot Admin to visualize server metrics and how to export Stream/Task application metrics to external application monitoring tools. Add visual representation for related streams. This representation also includes nested TAPs and the downstream processing nodes in an overall topology view. For the complete list of features, bug-fixes, and improvements, please refer to the closed 1.1 family of GitHub issues. We welcome feedback and contributions! If you have any questions, comments or suggestions, please let us know via GitHub Issues, StackOverflow, or using the #SpringCloudDataFlow hashtag on Twitter.